Steve Turner has always been a car guy but life events take the best car guys out of the hobby but Steve had some outside motivation as he explained, “I’m a car guy and my boys told me I needed a project”. The decision to do it was one thing but Steve’s next decision was tougher – pick a project. 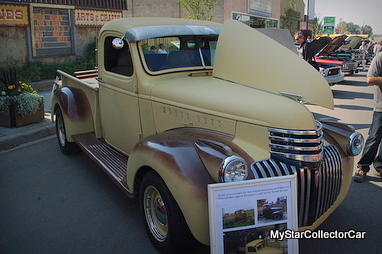 The logical decision was a 1940 Chevy pickup. Steve explained it this way: “My first car was a ’63 Chevy II 327 4-speed so I grew up with a 327 and I wanted something I could drive for awhile and I knew I wanted a 327 “. 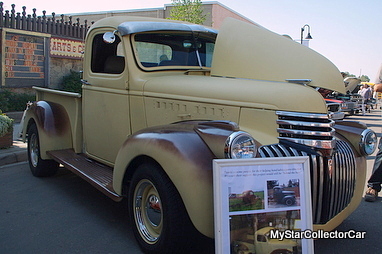 That ‘something‘ turned out to be a 1940 Chevrolet pickup and he jumped into the game back in 2009, “ I got started then but I got sick for a year”. Steve was clearly undaunted by the setback because he mapped out the project like a pro. 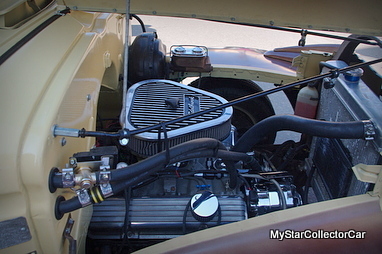 The engine was his first priority, “It had a 305 but a guy had a ’67 Chevy truck with a 327 because he went to a big block”. Steve was clear from the outset about the 327 and this one definitely fit the bill. 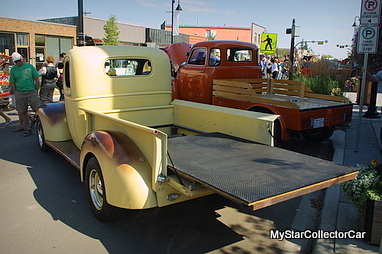 There was a fairly significant search for parts as Steve recalled: “I had a parts truck and that supplied running boards but it needed other stuff. I found a ’39 hood ornament even though this is a ’40 and it didn’t come with it plus I needed the vertical part of the grille and I phoned this guy and he told me I could have the whole thing for 150 bucks”. 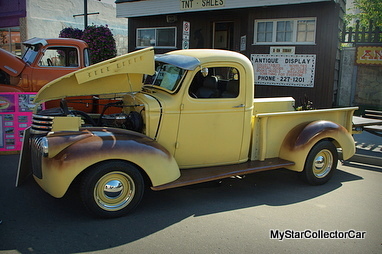 The truck was in mid-project phase when Steve bought it: “Just got it done, that cab is from a 2-ton grain truck plus it came with a ’84 Pontiac frame under it and it didn’t have seats so I was driving it by sitting on milk cartons but now it has ’98 short box Chevy seats. I went for the aged paint look too “. 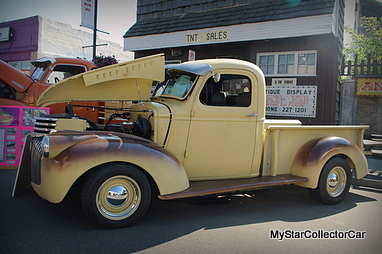 Steve had a vision for this truck that involved modifications that were never considered back seventy four years ago. 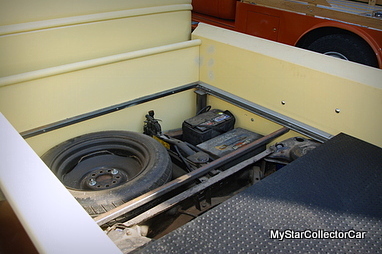 He designed a roll-out truck bed: “I built the box myself and now it’s got cam rollers on it and each one is rated at 250 pounds, I wanted access to the stuff that’s under it, I made signal lights and park lights for it “. There are clearly many moving parts on any vehicle and when you take them apart you end up with a few glitches and this ’40 Chevy was no exception, “It was locking up in 4th so I ended up driving it in 3rd. It’s got air bags so it was rubbing on the fenders when it went over railway tracks. 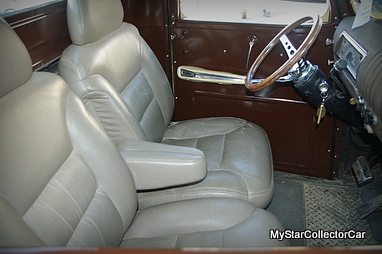 The window cranks work pretty good but it still needs some air conditioning but it does breeze okay when it’s moving”. The Chevy was relatively easy to safety, “It just needed ball joints to pass an out of province inspection”. 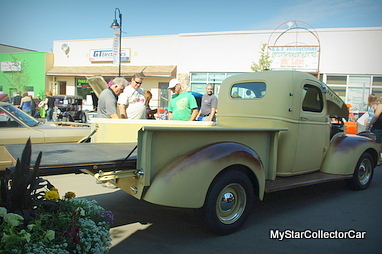 Steve hadn’t had much time behind the wheel but he was already making plans for his ’40 Chevy, “It’s got a 2:92 posi rear end but I’m going to get a trailer hitch so I can haul stuff to the dump”. That might not be why most guys build a vintage ride but it might give Steve an edge in the practical project debate.